Salads are something I love, but I don't make nearly often enough. Well, I should say, I make myself a salad nearly every day for lunch, but what I mean, I suppose, is I don't try different varieties enough. I love to have meat in a salad, especially chicken, but the effort it takes to cook said meat, is usually more time then I want take for a simple salad. Especially, if I only had a salad on the table for dinner, I would be definitely getting some looks from the rest of my family, particularly my husband. He is a fisherman, so any time of the year, he is doing hard labor, whether it be on the boat for 12-14 hours a day, or in the shop building traps and working on gear, so he always looks forward to hearty meal at the end of the day. So, all the effort it takes to make an elaborate salad that is just going to be a side, isn't always worth it for me. That being said, I do occasionally serve a hearty salad (if that is such a thing?) for dinner with bread if I just really don't feel like cooking an multi-dish meal. So, about this salad. 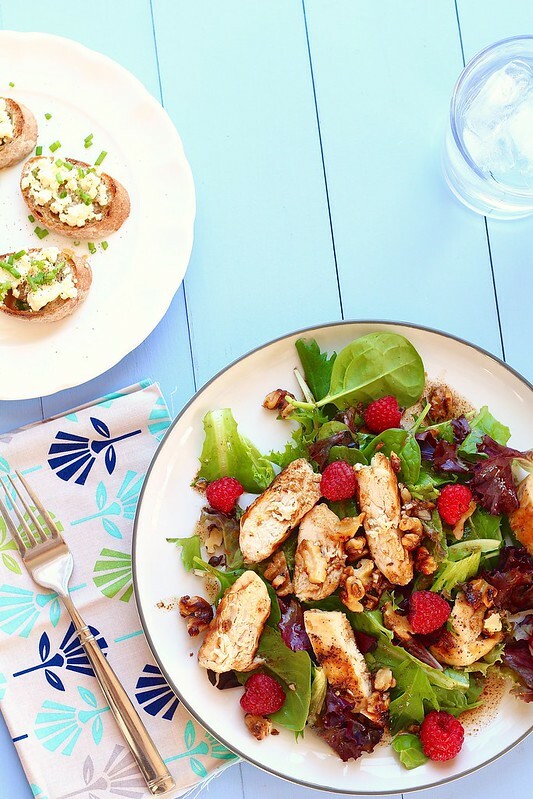 This is a more involved salad, but it makes the perfect lunch. I've decided that lunch, when my kids are at school, is a great time for me to make meals that sound good to me. I made the brie pizza a few weeks ago, then I decided to make this salad. Why not!? My husband was home for lunch that day since he was helping replace some windows in our old house, so I made him this salad as well. Well, it was a big hit, for both he and I. He was raving the whole time. I was too. For me, I don't usually like to add fruit to a salad, mostly because I think the combination is kind of weird. But, after this salad, I may be converted. It's funny how something so simple can make such a difference. Now, I know this may seem like more of a “summer” salad, which it most definitely can be, but why not be rebellious and just use a grill pan instead of a real grill? That's what I did. Or, if you want to be super healthy, bake the chicken instead! Any way you prepare the chicken, I know you won't be displeased. Oh- and the bread on the side is something you should really try out too. It is seriously amazing. It's simple french bread (or whatever you have on hand works too), sprinkled with feta cheese, placed under the broiler for about 2 minutes, until the bread is crispy and the cheese is soft, then pepper and fresh chives are sprinkled over the top. Really simple, and really delicious. Heat a grill pan over medium-high heat. Coat the pan with cooking spray. Sprinkle both sides of the chicken evenly with salt and pepper. Place the chicken in the pan, and cook, until golden brown on both sides and completely cooked through, about 10-15 minutes on each side. Remove the chicken from the pan to a cutting board and let stand for about 5 minutes. When slightly cool, slice into 1/4-inch slices. Meanwhile, place the walnuts in a small skillet over medium heat. Toast, stirring frequently, for about 4 minutes. Stir in the brown sugar and butter and cook for about 4 minutes, stirring often, until well coated. Remove from pan and coarsely chop. In a small glass measuring cup, whisk together the olive oil, balsamic vinegar, mustard and garlic. Divide spinach between two plates or bowls. 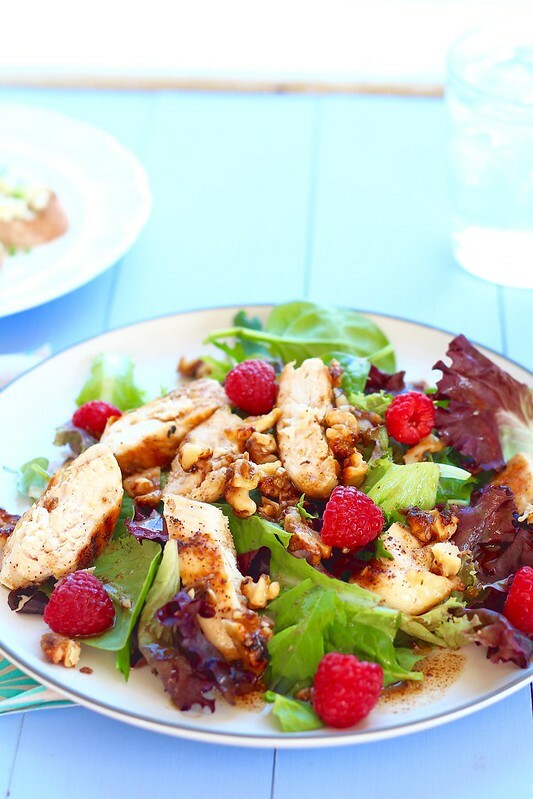 Top with chicken, walnuts and raspberries. Drizzle the balsamic mixture evenly over the top. Serve immediately.